Greetings from somewhere along the coast of Alaska. 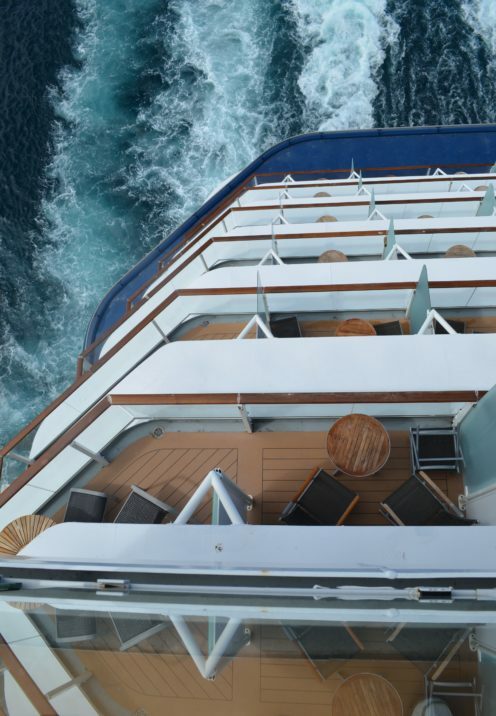 I am composing this post about the best Mac and Cheese I’ve ever had from my Aft Facing Sky Suite onboard the Celebrity ship, Solstice. 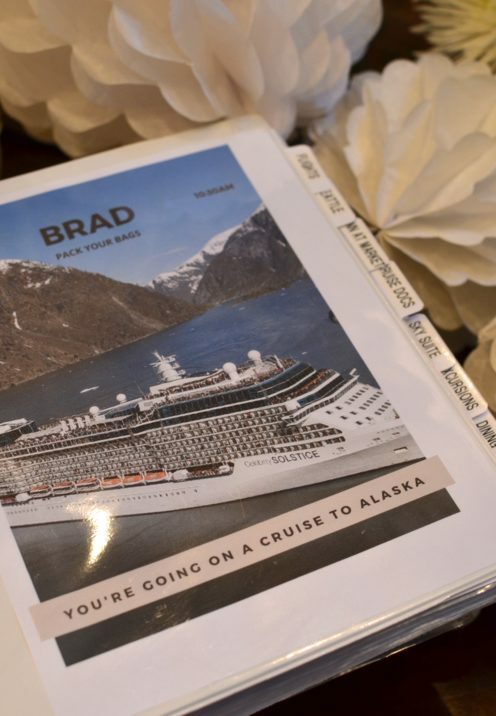 you will recall that I gave him a cruise to Alaska for his birthday. He had all of 5 days to wrap his head around the fact that in less than a week he’d be on a cruise. So off we went and here we are. 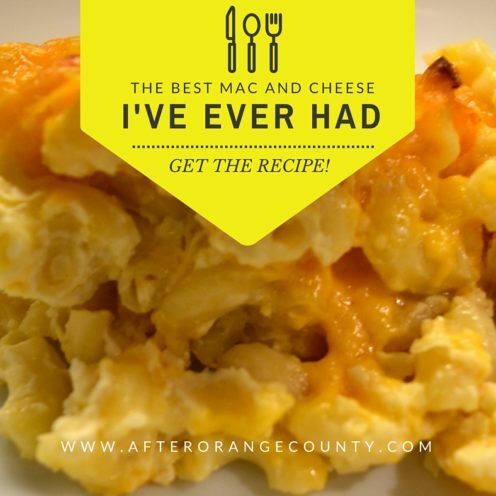 However, before I get too far ahead of myself telling you all about our trip, I wanted to keep my promise to give you the recipe for the best mac and cheese I’ve ever had! 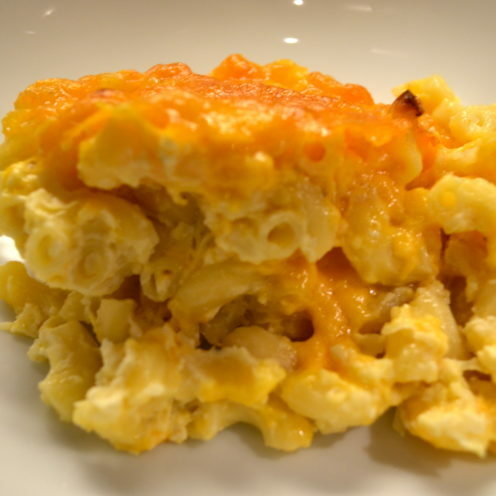 It’s the Southern-Style Macaroni and Cheese that I served at my husband’s birthday party, and it really is very, very good. I got the recipe from Saveur Magazine who adapted their recipe from one that had been published in The Gift of Southern Cooking, (Knopf 2003) by southern culinary legends Edna Lewis and Scott Peacock. However, it is rare that I ever follow a recipe as originally written, so I too have adapted it to conform to my liking, and like it I do. I think you will too! What makes this recipe particularly unique are several things. 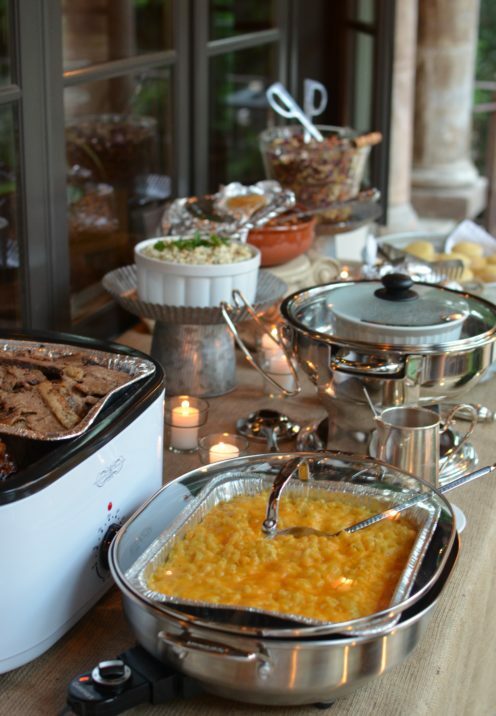 First, it is not made by preparing a roux, a white sauce to which cheese is added, which is the typical method. Instead, the ingredients are simply mixed together and the thickening happens naturally in the baking process. That’s because it also includes 2 eggs which help the sauce to come together. 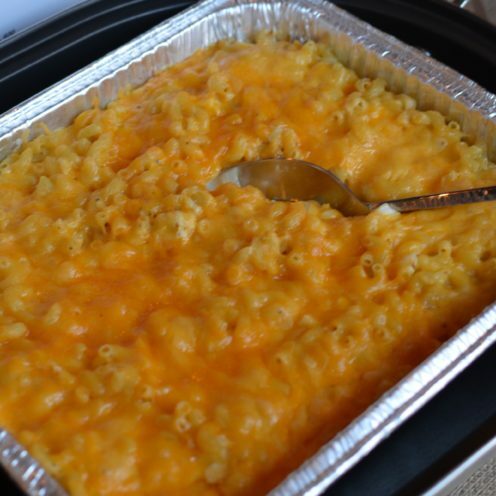 Additionally, the recipe calls for a grated onion, and this to me is what really sets the flavor apart from other mac & cheese recipes I prepare. But the most astounding thing is that the macaroni is only par-cooked a mere 3 minutes before it’s added to the cheese sauce. It too does the rest of the cooking in the oven, absorbing all the tasty liquids and moisture from the sauce instead of from a boiling pot of water. All things considered, this is a terrific recipe if you like mac and cheese, and who doesn’t like mac and cheese?? 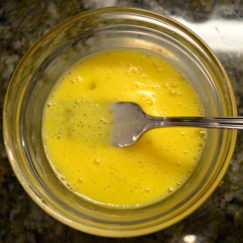 Using butter, grease a 9″ x 13″ baking dish. 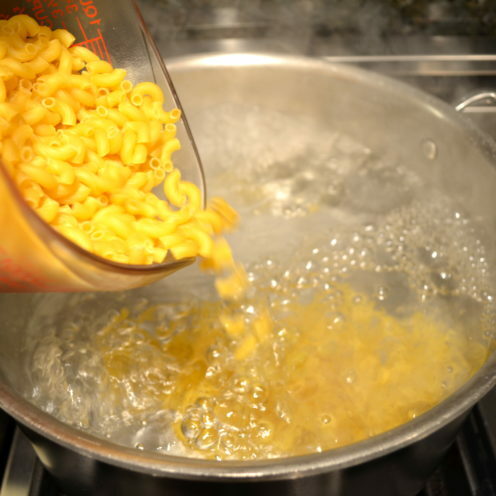 Add 1 pound elbow macaroni and cook 3 minutes, NO MORE! Drain pasta and transfer to a large mixing bowl. 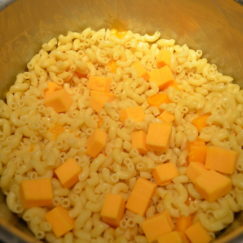 Stir in 2 cups of cubed, extra-sharp cheddar cheese and set aside. In a separate large mixing bowl whisk to combine 2 tsp. salt, 1/2 tsp. coarse ground pepper, 2 Tbsp. flour, 1 1/2 tsp dry mustard and 1/8th tsp. cayenne. 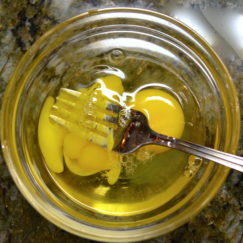 Add 2/3 cup sour cream and 2 beaten eggs and whisk until smooth. 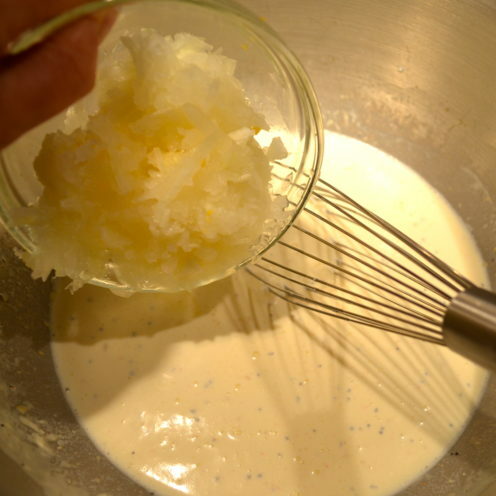 Whisk in 2 cups half-and-half, 1 cup heavy cream, 1 grated onion, 3 minced garlic cloves and 1 tsp. Worcestershire sauce. 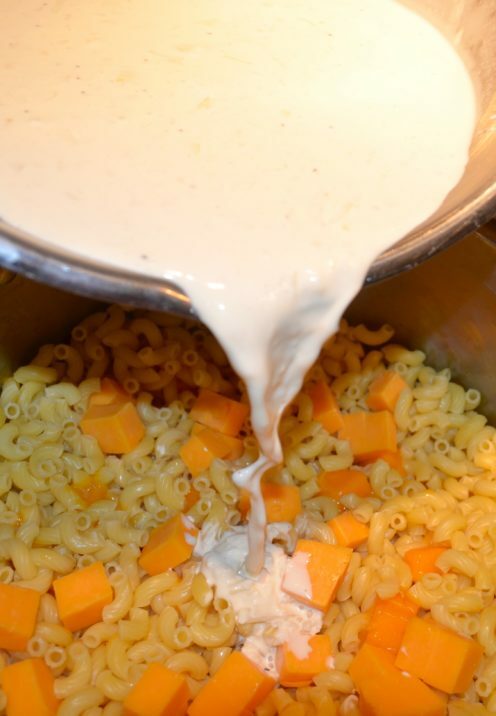 Pour the creamy mixture over the reserved pasta mixture and stir to combine. Pour into the greased baking dish. 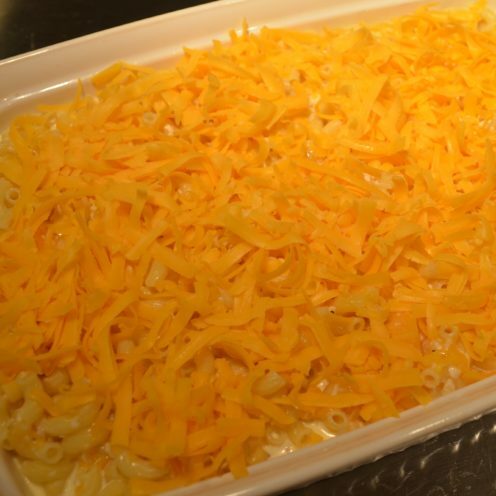 Sprinkle 2 cups grated extra-sharp cheddar cheese evenly over the pasta. Bake at 350º for about 30 minutes until set. Enjoy the ooey, gooey goodness of it all! I adapted this wonderful recipe from one found at Saveur, Jan. 2011. This super creamy and cheesy recipe is made even better with the addition of a grated onion. 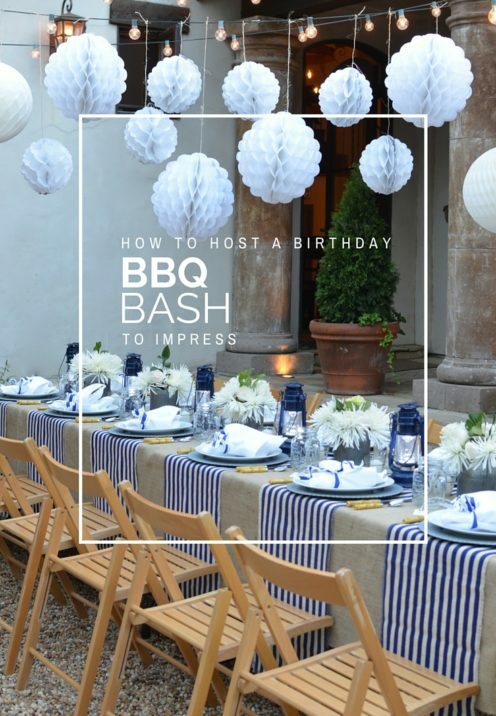 Plus, it's an easy preparation that does not involve the traditional making of a white sauce. Using butter, grease a 9" x 13" baking dish. Add pasta and cook 3 minutes. 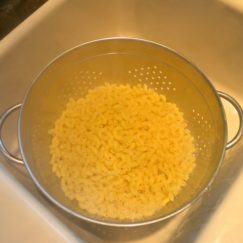 Drain pasta and transfer to a large mixing bowl. Stir in the "cubed" cheese and set aside. 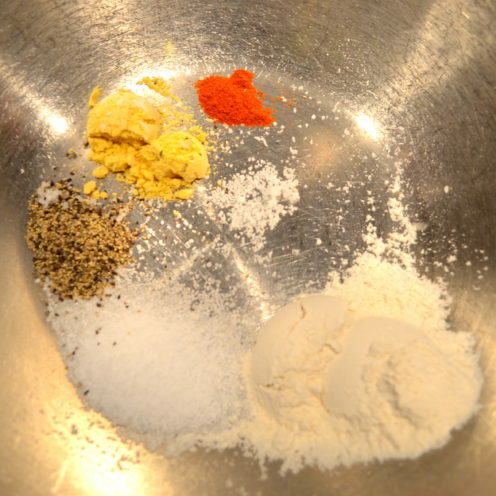 In a separate large mixing bowl whisk to combine the salt, pepper, flour, mustard and cayenne. Add the sour cream and eggs and whisk until smooth. Whisk in the half-and-half, heavy cream, onions, garlic and Worcestershire sauce. Sprinkle the "grated" cheese evenly over the pasta. Please stay tuned and in my next post we’ll go traveling to Alaska!